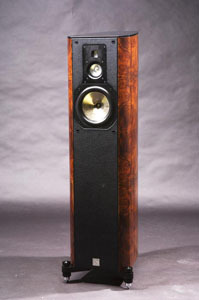 With the pursuit of excellence in mind, Volent engineers designed this superb bass-reflex speaker. With a frequency response from 28 - 100,000 Hz. it is more than capable of reproducing the dynamic range of latest SACD and DVD audio discs. The Paragon VL - 3 is equipped with self made patented 2.5cm "Twin-Ribbon" super tweeter able to produce the harmonics and high frequencies which "lift the curtain" on musical reproduction to give the listener a sense of presence as never before. Paragon VL-3 employed 3" Aluminum cone mid-range which give thee richest and sweetest midrange drive unit. A 7" Graphite/Titanium sandwich based cone woofer with it patented "Air" system offers rich yet detailed bass performance. Paragon VL-3 equipped with Graphite/Titanium sandwich based 7" woofer. The inner cone is made of Syntactic Polymer Hardfoam, outer layer is Graphite with Titanium ionized and sprayed on its surface. The merits of using both Graphite with its elasticity and Titanium's stiffness are combined and give the details bass. All Paragon VL-3 crossover is solder by our senior engineer with Point-toPoint structure. The reason for this is because the Point-to-Point crossover gives much wider signal path and much better sound quality than PCB does. The Paragon VL - 3 is of finely finished wood construction with 100% pure-wool filling and a 10mm back-plate of aluminium in high gloss finishing.